Ah, a New Year. You feel inspired and ready to go after what you want. You are ready for your resolution that says this year you will find love. You’re not the only one who has this type of resolution. Statistics show that having resolutions concerning relationships is pretty common. In fact, over 30% of the population has relationship resolutions, according to the Statistic Brain Research Institute. Unfortunately, the truth is that only 8% of the people actually achieve their goal and stick to their resolutions. If you want to achieve relationship success in the New Year, we have 5 top tips for you to make sure you end the year in love. Mind your mindset. So what if last year you dated more frogs than princes! This is your year and you have to believe it, right from the beginning. Start by visualizing your ideal man and think about what you are doing together and how you feel. Write down what you want. Read it every day and visualize your relationship. Say to yourself positive affirmations daily about finding the love of your life. Get your girlfriends together and have a vision board party to create images of your ideal relationships. Let people know what you are looking for. Ask a friend who is also looking for love to be your accountability partner to make sure you are managing your mindset. If you don’t think you will find him, you probably won’t. If you believe he is out there, then let the universe conspire to help you. Just be careful what you ask for! Get clear about your values. Understand what is important to you and what is important to you in a relationship. Review relationships past and decide what worked well and what didn’t. Past relationships leave clues. Look back at your relationships and identify first what you liked and enjoyed during your relationship. Chances are, the good times are in alignment with your values. Use the reflection to help you really clarify the values you want the love of your life to have or at least understand. Look at the lessons you learned. Knowing what you know now, what do you want? You want someone who is on the same page. Be certain. Be confident. Don’t settle. Be specific and ask for what you want. Make room for him in your world. When you meet him, you want to make sure you have room for him! Think about the kind of space you’d like to share with him. Visualize this and then look around. Make a note of what needs to be changed. Enroll a girlfriend to support you with this process if you are comfortable with this to ensure you make the changes needed to create the space you said you wanted to share and live in with him. Out with the old! Go through not just your closets, but everything from your medicine cabinet to your box of treasures. Take a moment to treasure something and then bless and release it. Look at your space and think about having the love of your life in your home. Will he be comfortable? Will you? Look around your home at your pictures and art. Do they show love? Do they reflect a couple? Is your bedroom full of “hard work” or is a place that is ready for love, connecting and tranquility? Create an environment that supports your goals. Say Yes! Say yes to meeting new people. Say yes to going out and trying something new. Say yes to something that you would probably have said no to in the past. Be open with possibility. Stop being hung up on what he looks like and start focusing on who he really is. So many times we have an image in our minds of what the perfect man should look like or what he should do for a living. Too many times we are so focused on the superficial that we forget how we want to feel in a relationship. Go back to what you visualized about your ideal man. Think about the qualities, traits and values you want him to have. Keep in mind what type of relationship you want to build and cultivate. Your “tall, dark and handsome” may just be average height, bald and handsome to you, complete with a big heart full of love and appreciation for you. Close the door on old relationships. Slam it shut. Once you close the door, you can regain new energy and new doors will open. Nothing holds you back more than holding on to an old relationship. Too many times women stay in a relationship because they are afraid they won’t find anything better. You will! When you hold on to him, you actually fill up the space that the man of dreams would fill with the man who just might be your “backup plan” if you never find that dream man. Why not free up that part of your world so you can let Mr. Right walk right into it? Let go of relationships that aren’t working. Stop the struggle of forcing a relationship that is not naturally integrating or feeling good. Once you do this, you can stop the cycle of choosing the same guy or creating the same relationship over and over again. Follow these steps – not just for 30 days, but until you meet him. Be the person you want to be in the relationship you want to have and show up big when you go out. Be the person you want to attract. Smile and do the things you love. Be intentional with finding the love of your life. Decide you are ready and stay true to yourself. It’s 2016 – and you deserve to have it all! This article originally appeared in the January 2016 issue of Kalon Women Magazine. 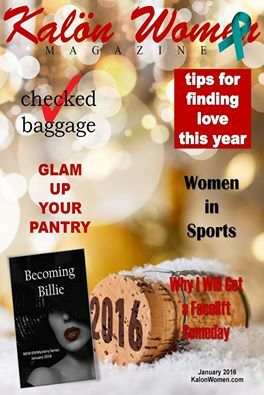 Click Here to learn more about Kalon Women Magazine.